The Grass Can be Greener in Your Own Front Yard: Keeping Your Lawn Healthy | Global Garden Friends, Inc. Taking care of your lawn doesn’t need to be a time-consuming or expensive project. With a little bit of planning and some high-quality products, you will be able to keep your lawn lush and beautiful for years to come. Here are a few landscaping tips and tricks that you can use to promote a healthy lawn. A thin layer of leaves might actually be good for your lawn, but you should make sure that the blades are able to peek through the foliage in order to get some sunlight. You also need to remove any tools or toys that have been sitting on the grass for more than a few days. When those items completely cover the grass blades, the underlying roots will eventually die off. Most landscaping experts agree that lawns need be fertilized and aerated at least once every six months. Unless you have a huge lawn, a handheld aerator will most likely suffice. It is important to remember that aerating is going to kill off some of your grass, but the stalks will grow back much stronger. After you are done aerating, you can then spread high-quality fertilizer across the entire lawn. Many homeowners make the mistake of mowing their lawns every single weekend, and that is usually quite bad for the grass. As a general rule, you should never remove more than one-third of the leaf blade. 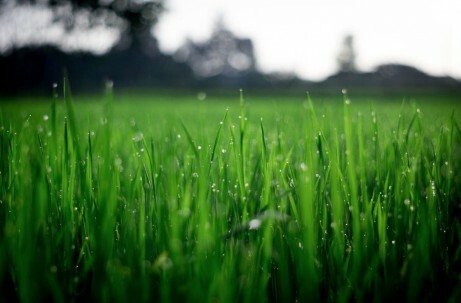 Depending on what type of grass you have and where you live, you might only need to mow a few times a year. As the weather begins to cool off, you can cut the blades slightly shorter because they will have more time to grow back. Investing in lawn sprinklers might be a good option if your lawn isn’t getting enough water. Most types of grass only need to be watered three or four times a week, but you want to be absolutely sure that the sprinklers cover the entire lawn. Modern irrigation systems are easy to adjust, and you will be able to control the watering schedule with a simple timing unit. If you have tried these few tips and tricks and your lawn is still dying, then you might need to contact a local landscaping specialist. One of those specialists will be able to help you come up with a long-term maintenance plan that includes altering the pH levels, adding fertilizer, and adjusting the sprinkler system. Author Bio: Dixie Somers is a freelance writer who loves to write about home and women’s interests. She lives in Arizona with her husband and three beautiful daughters.